A dental bridge is made up of two crowns on either side of the missing tooth connected to an artificial tooth, called a pontic, in the middle. These three “teeth” form the “bridge” that is matched to the color of your teeth and then cemented into place to provide a permanent solution to missing teeth. First, our dentist has to examine your mouth and the areas around the missing tooth to determine whether a dental bridge is appropriate for your situation. At your next and final visit, the permanent bridge is cemented into place and you’re all set! If you take care to practice good oral hygiene and maintain your proper dental cleaning and examination schedule, your new bridge should last for a good many years. 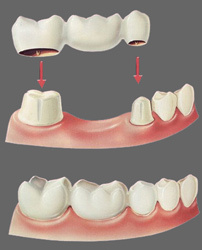 Bridges can also be placed on top of dental implants to replace up to 4 or 5 teeth at one time. We can work with specialists to co-ordinate this treatment. Contact us today to find out if a bridge is the solution to your missing tooth or teeth.